MOUNTAIN VIEW, Calif., March 15, 2019 /PRNewswire/ — Livongo, the leading Applied Health Signals™ company empowering people with chronic conditions to live better and healthier lives, today announced the findings of a study that demonstrated people with both diabetes and uncontrolled high blood pressure who used the Livongo for Hypertension solution saw significant declines in their blood pressure within six weeks. 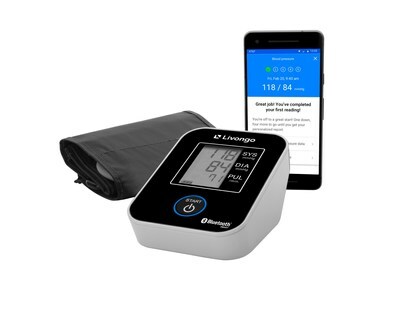 The Livongo for Hypertension solution includes a smartphone app that enables participants to monitor their blood pressure remotely, tips on healthful living, and the opportunity to connect with a health coach. The research findings will be presented on March 18, 2019 at the American College of Cardiology’s (ACC) 68th Annual Scientific Session being held in New Orleans, Louisiana. According to the Centers for Disease Control (CDC), one in three adults in the United States have high blood pressure1, and it’s estimated that only about 54 percent of them have the condition under control2. Every year, hypertension contributes to $131 billion in health-care expenditures3. Today, people with hypertension are offered little guidance outside of the time they spend in a doctor’s office. Without continued support, many people with high blood pressure do not understand how behavioral and lifestyle changes affect their blood pressure. Study participants, who had starting blood pressure higher than 130/80 mm HG, saw their systolic blood pressure (the top number of a blood-pressure reading) decline by an average of 11.2 mm Hg and their diastolic pressure (the bottom number of a blood-pressure reading) decline by 5.2mm Hg on average at six weeks. By better managing their blood pressure, participants reduced their risk for complications such as heart disease, stroke, and kidney disease. The 708 study participants had an average age of 54 years and 53 percent of them were women. At study entry, all of them lived with diabetes and 63 percent had blood pressure higher than 130/80 mm Hg, the threshold for a diagnosis of stage 1 high blood pressure according to the revised guideline issued in 2017 by the American College of Cardiology and the American Heart Association. A subgroup (28.7 percent) had blood pressure higher than 140/90 mm Hg, the threshold for stage 2 high blood pressure in the ACC/AHA guideline. All participants received a blood pressure monitor and cuff that connected wirelessly with Livongo’s smartphone app. Participants measured their blood pressure an average of four times a week and when they had their smartphones nearby, the readings were automatically transmitted to Livongo’s Applied Health Signals platform. After each reading, participants could open the app to review their results and get tips on managing their blood pressure by quitting smoking, following a healthy eating pattern, getting more physical activity, and reducing their weight. The Livongo app also enabled participants to compare their blood-pressure readings over time, schedule a call with a Livongo health coach, and share their results with family members, friends, or healthcare providers. Livongo recently announced that it will leverage Amazon Lex and Amazon Polly to power its voice-enabled cellular blood pressure monitoring system. The Livongo for Hypertension voice experience provides Livongo Members the ability to easily interact with Livongo via the most natural and personalized communication channel – their voice. This new feature adds to Livongo’s proven solution and enables a new way to deliver actionable, personalized, and timely health signals that drive behavior change and positive clinical outcomes. Livongo offers a whole person platform that empowers people with chronic conditions to live better and healthier lives, beginning with diabetes and now including hypertension, weight management, diabetes prevention, and behavioral health. Livongo pioneered the new category of Applied Health Signals to silence Noisy Healthcare™. Our team of data scientists aggregate and interpret substantial amounts of health data and information to create actionable, personalized and timely health signals. The Livongo approach delivers better clinical and financial outcomes while creating a different and better experience for people with chronic conditions. For more information, visit: www.livongo.com or engage with Livongo on LinkedIn or Twitter. 2 Merai R, Siegel C, Rakotz M, Basch P, Wright J, Wong B; DHSc., Thorpe P. CDC Grand Rounds: A Public Health Approach to Detect and Control Hypertension. MMWR Morb Mortal Wkly Rep. 2016 Nov 18;65(45):1261-1264.